As you round that last turn of the I-50 on the way to Lake Tahoe, you see it. Amidst the endless landscape of green pines, the smell of air so fresh you can taste it, and that sense that all the cares of world have slipped behind you, is the expansive blueness of Tahoe. Instantly you will believe that this must be one of the best views of Lake Tahoe that you will ever experience. However, you would be wrong. As you travel even closer to the jewel of the Sierra Nevada’s you will discover there are many locations which will thrill you with the visual wonder of Mother Nature’s power, beauty and awe. You’ll be amazed at how you can just sit and stare for hours at the allure of this place without an ounce of boredom or a sudden urge to check your social media accounts. You can drive the Mount Rose Highway (state route 431) to reach the lookout along the highway that captures the raw beauty of Lake Tahoe. Many travelers will limit their experience to this site and be filled with a lifetime memory. But for those that want a closer connection, strapping on snowshoes, or lacing up your hiking boots, can bring even more unexpected pleasure. Imagine walking along the ridge on a moderate uphill trek and suddenly coming upon a fog-filled valley where only the peaks of the Sierra Nevada’s can be seen. Or, watching the sun glisten off the snow and the lake as you peer at the East shore of Lake Tahoe. Surrounded by silence and the sight of your breath in the cold air, you’ll feel as if you are on top of the world. Emerald Bay may just be the most photographed areas in the area…and for good reason. Emerald Bay at sunrise is a photographers dream. Normally when you think of water you think of blue. You’ll be amazed and pleased with the inlet on the west side of the lake where the water resembles the color of the finest emerald. 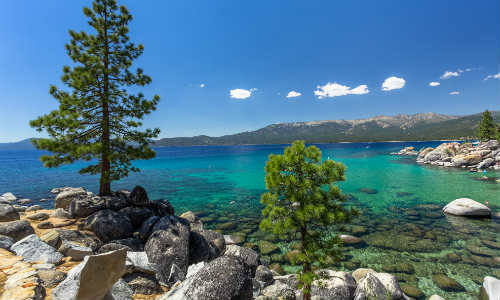 If you’re up for it, hike along the Rubicon trail and not only will you keep Lake Tahoe in view, but you can also enjoy the historic lighthouse, rocky outcroppings, and sandy coves. The stark contrast in colors of the lake, the sky, billowy clouds, and the green of Douglas firs and Jeffrey Pines give “eye candy” a whole new meaning. HINT: Find other popular short hikes in Lake Tahoe. Take to the skies for one of the most unique experiences of Lake Tahoe. From this vantage point you can really get a sense of the absolute size of the lake. Standing on the shoreline, you know that the lake is big because you cannot always see land on the other side. But from the air in the intimacy of a helicopter the vast beauty of the lake on such a grand scale will simply take your breath away. During your ride you see the remote beaches and the majestic mountains – worlds that seem untouchable and yet so close. HINT: For incredible helicopter tours and the best view in Lake Tahoe, fly with Reno Tahoe helicopters. Another way to look at life from an elevated perspective is with a Gondola Ride over Heavenly Valley. In case you’re mind jumps to skiing, you can enjoy this ride and the amazing views all year round. You can hover over many of the areas that can only be accessed on foot; however, you can enjoy everything from the gondola without ever breaking a sweat. Unless, that is, you remembered to bring a thermos of hot cocoa with you for the ride! If you can visit Sand Harbor in early Spring as the ground snow has melted and the mountains are still adorned with white caps, you’re in for a special treat. 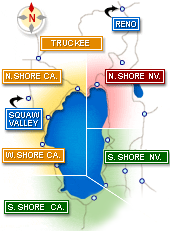 The water of Lake Tahoe has depth clarity of about 70 feet. The views at Sand Harbor can give you the contrast of that depth in the water that is matched by the heights of the mountains in the distance. But even if you cannot make it that time of year, Sand Harbor is the only Lake Tahoe beach that is open all year round. It’s easy to access and offers amazing views so it’s no wonder that it’s a top destination for weddings near Incline Village. HINT: Read about other incredible places to check out the view in our list of top places to stop while driving around Lake Tahoe.